Archaeopteryx, an extinct bird known from a small number of fossilized remains found in southern Germany, is claimed by evolutionary biologists to be the first species of bird to appear on Earth, as well as a so-called "transitional form" between reptiles and birds. There are two criticisms of Archaeopteryx. The first is that the fossils are an elaborate hoax as claimed by the British astronomer and physicist, Sir Fred Hoyle; the second is that Archaeopterix is a true bird, and not a transitional form suggesting evolution. Archaeopterix was roughly crow-sized, with an over-all body length of 18 inches. Discounting the feather impressions in some of the fossil specimens, Archaeopterix had a build generally-similar to that of a small theropod dinosaur, with the species Compsognathus cited. Both wings ended in three-fingered claws. The tail was long, feathered on either side. Evidence that the legs were feathered as well was shown in the Berlin specimen as recently as 1880, prior to that fossil's preservation. The bill, like modern birds, was capable of independent movement in both the upper and lower jaws; unlike modern birds, both jaws were studded with small teeth. All known fossils - approximately thirteen - were found in the Solenhofen limestone formation of southern Bavaria, Germany. 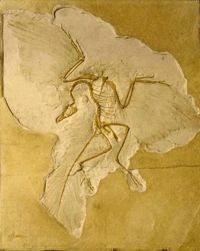 In 1983, a half-dozen leading British scientists led by noted British Radio-astronomer Sir Fred Hoyle carefully studied the plates and counter-plates from the two best Archaeopteryx specimens, and found evidence of forgery. They discovered that the front and back slabs of each specimen do not match. They found that an alteration had been made to the left wing as depicted in an 1863 drawing. They concluded that the feather markings had been imprinted by hand. They also found that etching process had used cement blobs. When the scientists requested the ability to use an electronic microscope and carbon-14 dating, the museum refused and withdrew the specimens from the scientists. The same British Museum had been responsible for the Piltdown Man fraud. The second criticism of the Archaeopteryx, that it is not a transitional form, has been strengthened by the work of anatomist Dr. David Menton suggesting that Archaeopteryx is a true bird with flight feathers, not a transitional form at all. In 1994, an article explained that the Archaeopteryx was essentially a flying bird, with a large cerebellum and visual cortex. The fact that it had teeth is irrelevant to its alleged transitional status—a number of extinct birds had teeth, while many reptiles do not (the South American hoatzin, Opisthocomus hoazin, also shares with Archaeopteryx clawed digits in its wings, albeit as juveniles). While most evolutionary scientists agree that the flight feathers of Archaeopteryx were essentially modern, several papers since have argued against Feduccia's claims about the anatomy of Archaeopteryx Specimens such as the Thermoplis Specimen  are thought to clearly show that the arms, wishbone, tail, feet, hips, and palate of Archaeopteryx were more like meat-eating theropod dinosaurs than modern birds. There are currently only thirteen known specimens of Archaeopteryx. All were allegedly found in the limestone of the Solnhofen area in Germany and have not been substantiated by any discovery anywhere else in the world. Feather 1860 Near Solnhofen Described by H. von Meyer Humboldt Museum für Naturkunde in Berlin Single feather only. London specimen 1861 Near Langenaltheim Announced by H. v Meyer British Museum of Natural History, London Missing the head and neck; detailed feather impressions. Haarlem Specimen 1855 Near Riedenburg Described by H. von Meyer Teylers Museum, Haarlem Not classified as Archaeopteryx until 1970. Remains of wing claws and leg bones. Solnhofen Specimen 1960s Near Eichstätt Described by Wellnhofer Bürgermeister-Müller-Museum in Solnhofen Nearly complete; no feather impressions. no name given yet Currently studied by Paleontologists of Ludwig-Maximilians-Universitaet. Hartman, Scott, Clarification statement on Thermopolis specimen 1 December 2005 (The Wyoming Dinosaur Center). Sarfati, Jonathan, Bird evolution?, Chapter 4 of Refuting Evolution. Wieland, Carl, Archaeopteryx, Creation 1(1):12–16, June 1978. ↑ 4.0 4.1 4.2 4.3 4.4 British Journal of Photography (March–June 1985). W.J. Broad, "Authenticity of Bird Fossil is Challenged," N.Y. Times C1, C14 (May 7, 1985). T. Nield, "Feathers Fly Over Fossil 'Fraud'," New Scientist 1467:49-50. G. Vines, "Strange Case of Archaeopteryx 'Fraud'," New Scientist 1447:3. ↑ "The tenth skeletal specimen of Archaeopteryx," Zoological Journal of the Linnean Society, 149:97-116, 2007. ↑ Wikipedia claims an eleventh specimen, but only lists ten. This page was last modified on 9 April 2019, at 00:14. This page has been accessed 30,974 times.